We’re passionate about and what we do best – finding rewarding careers for our candidates and talented staff for our clients. Just as we are determined to improve as a company, we are also dedicated to helping each of our employees continually grow as professionals. We work together to achieve our goal of becoming the Staffing Industry Leader for top-tier talent, exceptional staffing, and innovative workforce solutions. As each individual succeeds, we all succeed. Going the extra mile to develop our relationships with candidates, clients and within our team. Helping others by building community and getting involved in something bigger than ourselves. Cross-functional collaboration, eliminating vertical barriers and always keeping an open door. Training and development never stop throughout an individual’s career. Empowering our team members to make decisions and taking smart risks – not in micromanagement. Investing in our teams through mentorship and continuing education. TRC Staffing is here to help our clients grow their businesses and to help our employees build their future. 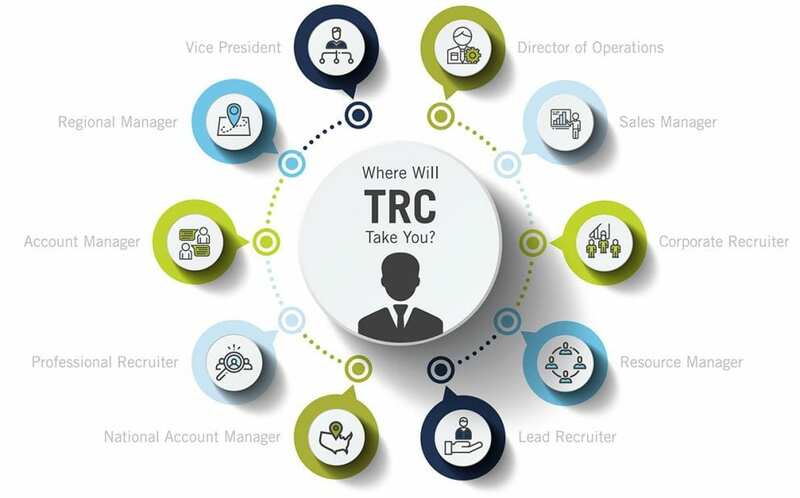 Everyone at TRC Staffing, including our leadership, begins their career here working in recruiting or operations. Our Sales Incubator training program allows new staffers to spend time in different departments honing their skills and learning how TRC works. Our commitment to outstanding training means all employees have the opportunity for advancement and the opportunity to achieve professional and financial success.